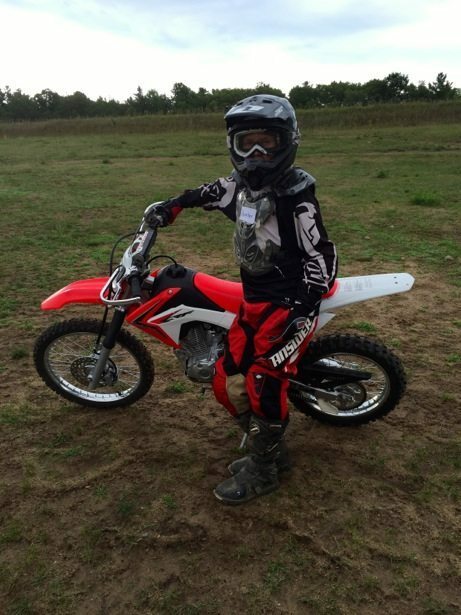 Hunter has been wanting to buy a dirt bike for a while. We decided that it might be a good idea to try one out before continuing to work so hard to save up. 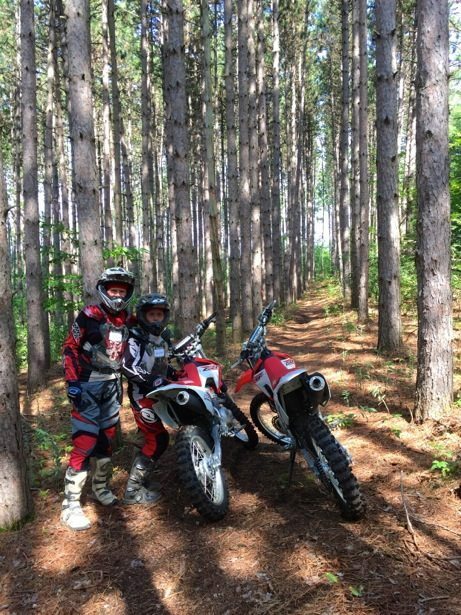 After lots of research done by Hunter he discovered Trail Tours, that were located just an hour away from Grandma’s house in Ontario. 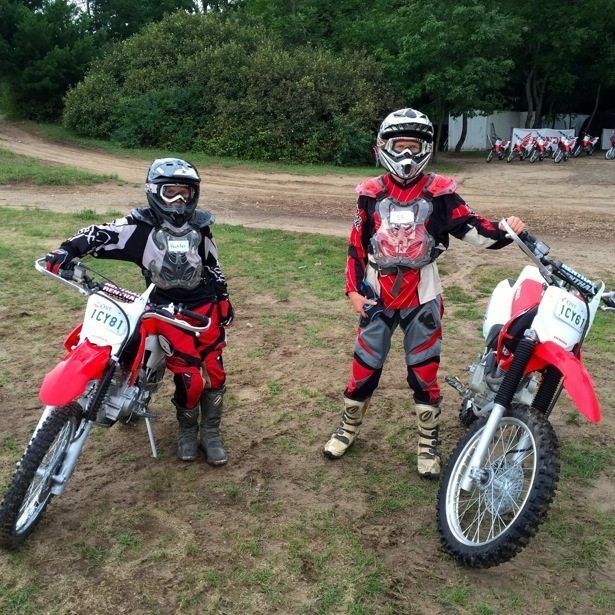 His 13th birthday present was now covered… a Mom and Hunter beginner dirt biking day! Trail Tours is located near Pontypool in Ontario and are right next to the Ganaraska Forest, which is over 11,000 acres in size and has over 100 km of multi-use trails that allow motorized vehicles (there is an additional section in the centre of the forest set aside for passive use) Note to selves: they have a 60km IMBA Epic Mtn Bike trail that we should come back and check out. They have a huge inventory of Honda bikes, with something to fit everyone, and also provided all of the gear for the day. After getting ourselves suited up we headed off to the riders meeting to learn about general safety and program expectations. It rained ALOT the day before we went, which turned out to be fabulous for the sandy trails, and it also lead to a number of cancellations so Hunter and I were in a class of our own. 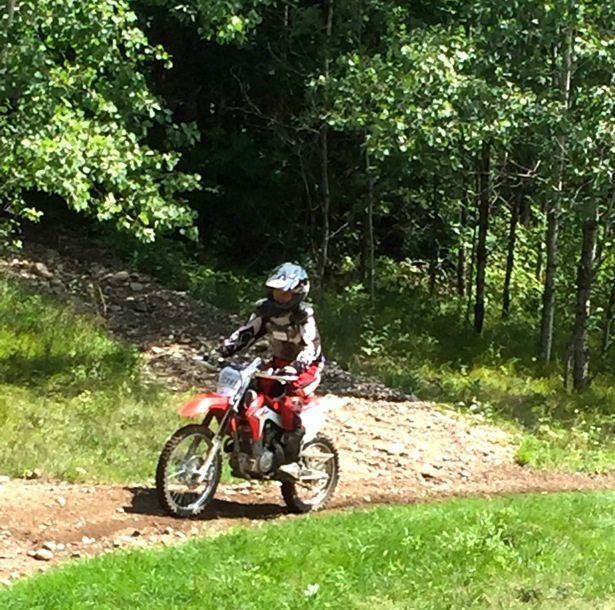 We spent the first hour on a small loop right at the Trail Tours site learning the basics of dirt biking. I was amazed at how quickly we progressed through the skills and it was not nearly as difficult as I thought. Lots of mountain biking logic was transferrable and the whole gear shifting thing with your foot went super smoothly. We still had an hour to spare before lunch so we headed off into the forest to learn more skills (going over logs, tight turns and emergency braking) and had our first taste of actual trail riding… which left us really excited for the afternoon! You can bring your lunch or buy it onsite for $9.00. Lunch break is between 45 minutes to an hour depending on how busy things are for the staff as the half day transition also happens then and they have to manage gear returns and gearing up. Hunter was bouncing around and couldn’t wait to get going again… Our first stop in the forest was a fun pump track where we got to practice rollers and burms, going progressively faster as we got more comfortable. The rest of the afternoon flew by. We rode wide track, narrow track, single track, up hills, down hills, sandy terrain and rocky terrain. Our highest point was this really neat look out where you could see the edge of Lake Ontario (beyond the windmills) and supposedly on clear days you can see New York state. 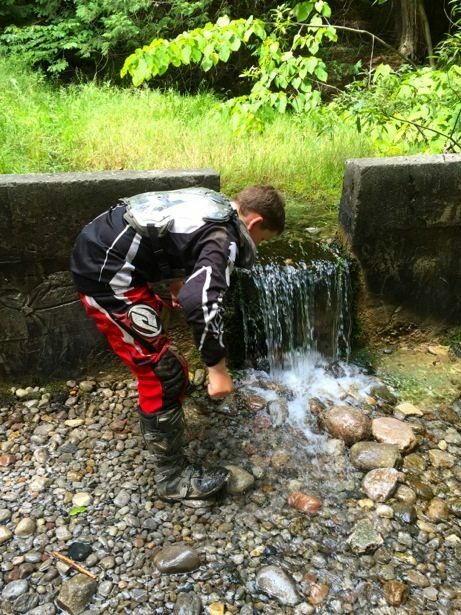 We finished up our ride by stopping at a spring that is in a protected area of the forest. The water was crystal clear and so refreshing, covered by huge canopy of trees and lots of mossy areas. A perfect way to end the day. We had an amazing day. The staff at Trails Tour were great – very supportive, very informative and super friendly. Big thanks to Chad and Danielle for a wonderful first experience. I don’t think it will be our last. 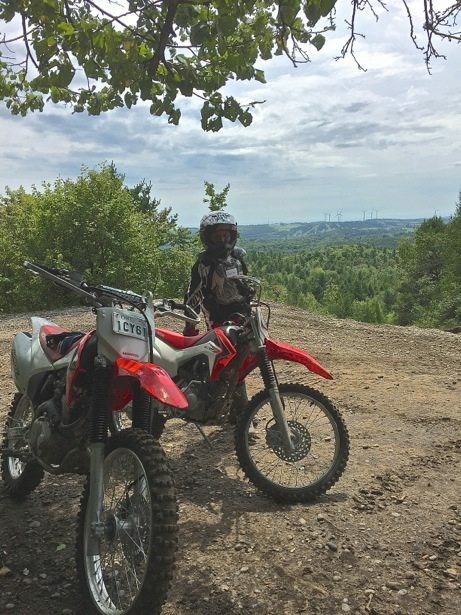 We definitely recommend Trail Tours – whether it be for beginners looking to learn to ride or for experienced riders to get some guiding on a great set of trails.